6.00 points at 23 votes (rank 628). 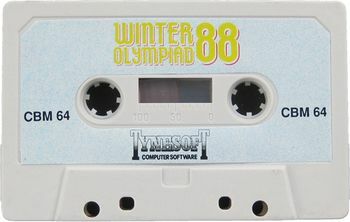 Winter Olympiad 88, also known as Winter Challenge, is a game that was targetedly developed as a competitor product to the Epyx Games series. All disciplines are also available in the Epxy Games. They were partially gussied up graphically and equipped with slightly changed controls. 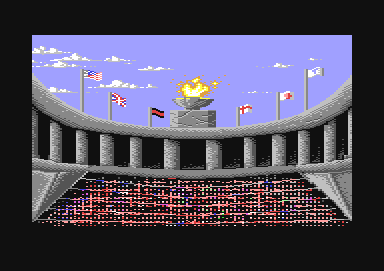 First, the number of players (1-6) is chosen, then the corresponding name is entered (8 letters) and the desired country is chosen and finally you can choose from the available five disciplines (Ski Jump, Down Hill, Biathlon, Slalom, Bobsled) the ones that should be part of the tournament by pressing the key "Y" (yes) or "N" (no). The design came out very differently in the single disciplines and goes from very detailled to roughly pixelated. Many small elements were animated. In some disciplines a 3D view was realised. There is no discipline where two players can compete at the same time, unfortunately, there is no proper final end evaluation and also the records are not saved. Additionally, you need to reload and restart the game after all chosen disciplines were absolved! In Ski Jump you have 3 tries to make a jump that is as far as possible and stilistically as smooth as possible and a landing without a crash. The jump itself is experienced as a viewer from the jumping point, the rest of the jump is shown in side view in front of a scrolling background. The mark for style is calculated from the duration of the parallel position of the skiers. During the flight look for the tip of the red skier. If it is up - pull joystick backwards, if it is down - push joystick forwards. For each right reaction the mark for style rises by one point. In Down Hill you see the track from the view of the skier (3D-view, you run behind the character). Trees and tree stumps (these can be jumped) cause a crash when touched. In the upper gliding part you can fully accelerate for about 18 seconds. If you snooze, you lose! At a too low speed the steering manoeuvres do not work properly any more! The optimum speed in the curvy middle part is in the upper green area. (close to yellow). The optimum speed in the beginning and end part is in the upper yellow area. (close to red). Biathlon is a sport where performance and power of concentration are put to a hard test. The aim is to get over a certain distance equipped with skiers and a rifle, with only few missed shots and within a good time. For every hit target you get subtracted 10 penalty points. Example: At a time of 54:62 with altogether 8 missed shots you get 999-546-80 = 373. Slalom is shown from the bird's view and the angle is about 45 degrees. There are flags on the track that need to be driven around so that the yellow flag is to the right and the brown flag is to the left of the skier. Each missed gate costs each 20 penalty points. Example: A time of 25:20 with one mistake makes 999-252-20 = 727. A steady and quick pressing on the fire button during the run raises the speed of the skier as soon as he is aligned with the slope line. As in Down Hill you drive perspectively behind the object that you control, so you are behind the bobsled on the track. At first the double bobsled is accelerated by the fellow runner, then you mainly need to steer against the centrifugal forces in the curves (i.e. left turn - steer to the left, right turn - steer to the right). If you are too late with the reaction or steer into the wrong direction, the bobsled is thrown over. If you steer to early, you wil lose speed. All three runs are added and make the total time. A crash is counted as 4:00:00! You can already pull the joystick into the correct direction before the start of a curve (even as soon as the last turn is done)! 64and360: "I actually rather liked to play the game at that time (it was part of the collection "Game, Set and Match 2" by Ocean). In my opinion it cannot compete with the games by Epyx.... It is nevertheless quite nice to go on a chase for highscores.... I also get "nostalgic" thoughts with this game. 8/10 points. 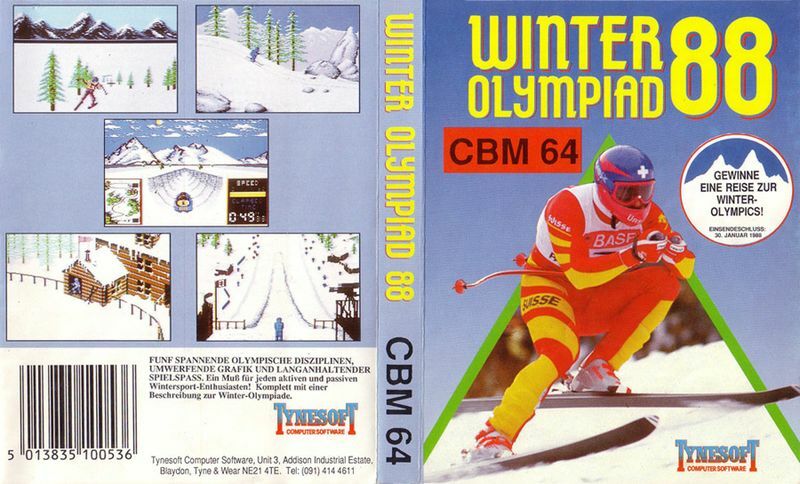 TheRyk: "As the public enthusiasm for winter sports was still great in 1988, Tynesoft obviously had the cunning plan to profit from that fact, although there existed already several good games with that topic at that time. The result is less than poor. 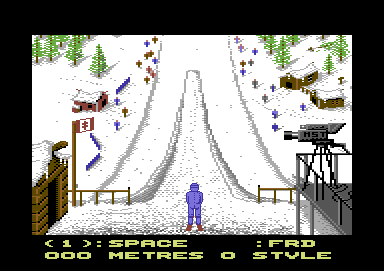 Ski Jump and Slalom are at least playable, but also by no means better than in the Epyx Games. Biathlon is already on the brink of total torture. You creep at snail's pace through the snow and finally hit the targets either luckily or after a great deal of practice. Downhill is a joke, because you can not even see the route for all the trees. Bobsled is not only very boring, too, but also forces every player to do three attempts. 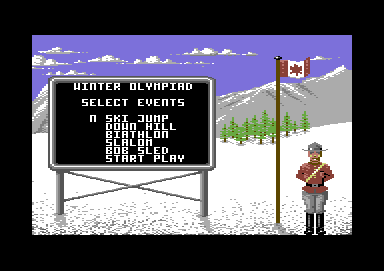 All in all, Winter Olympiad is just terrible and unnecessary. 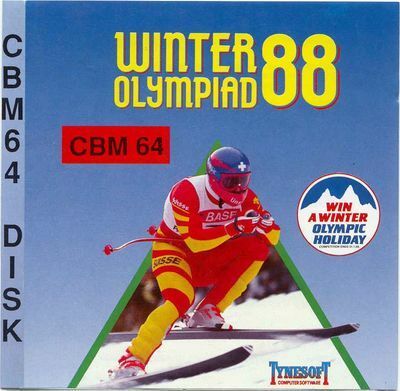 The Games - Winter Edition by Epyx was no hit either, but far better than this flop which I can only rate 3 points including 1 for the good audiovisual presentation." 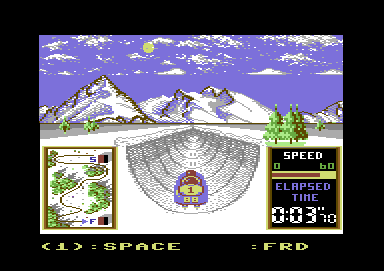 H.T.W: "As each of the "slightly" older "C64 veterans" instantly compares with the Winter Games scale when he sees a product with the corresponding topic, it is no wonder that this game "falls through the cracks" when playing it for the first time. But if you play it for a longer time (especially with several players or in the frame of a competition) some subtleties show themselves that definitely raise the value in playing the game. As a positive aspect one needs to mention amongst others the graphics and the 3D view in the discipline "Down Hill". Although you are reminded of a slide show in this discipline, you are again and again surprised how fast such sequences of images are interpolated by the brain into a reasonably fluent something, and from this point onwards (at the latest when you downhilled to the finish line) it is even fun (a small tip: Do not let yourself get irritated by the trees and cast your view over the runner's head). Nevertheless, one needs to criticise the fact, that the records are not saved on disk and that the whole game even needs to be loaded again after you have finished..."
Bamse: "I want to cite the "Erste Hilfe"-game tips from the Happy Computer evaluation:´Switch off the computer, dig up Winter Games, load and play.´ ! This says it very well, because this game has the smack of a cheap copy. Partially quite nice, but why should I go with the copy if I can play the original?" This page was last modified on 8 November 2015, at 16:00.